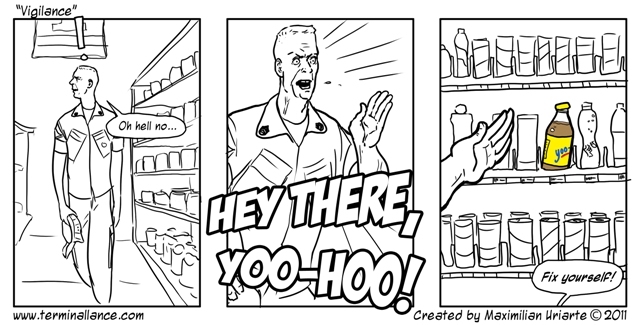 We’ve pulled another “Terminal Lance” strip from the Marine Corps Times archive. “Vigilance” first appeared in the issue dated June 27, 2011, and includes, in my opinion, one of TL creator Max Uriarte’s most outstanding depictions of the infamous — or dreaded? — knife-hand. “Vigilance,” original pub date June 27, 2011. This strip calls to mind a cover story we did back in 2010 examining the Lance Corporal Underground’s growing presence on the web. Max, not then a contributor to Marine Corps Times, was interviewed for that article, which includes (tragically) the newspaper’s only known reference to the term “knife-hand” — references to the title of Max’s book notwithstanding. A page appeared on Facebook this year for “Sgt. Maj. Knife-hand,” a reference to a martial arts strike. The profile used the likeness of a senior enlisted Marine, and made lighthearted references about traveling to other countries. The page created problems because its humorous intent could be twisted. … The Corps was notified by “various leadership” that the Sgt. Maj. Knife-hand page was potentially problematic, and could be removed due to a violation of Facebook’s terms of service, which say users must not misrepresent themselves with profiles they post. The Corps notified Facebook … and the page was removed within days. Snapped in August, this photo shows Gunnery Sgt. 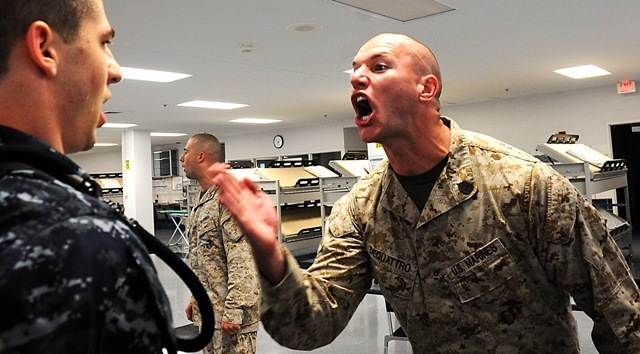 Michael DeQuattro instructing a visibly sweating midshipman how to address a staff noncommissioned officer. If you’ve got photos or videos like this one, email them to us: marinelet@marinecorpstimes.com. If we get enough good ones, we’ll share them here on Battle Rattle. It’s just occurred to me: That could be Gunny’s saliva on the side that poor kid’s face. Nah, if it was the gunny’s projectile spit there would be small holes and streams of blood. I tend to lose respect for SNCOs and others who resort to screaming and knife-handing as their first action when correcting something as menial as forms of address between branches. @Mike (in the above comment): Obviously you’re not a Marine. It can’t be explained to you, so don’t worry about it. You’ve got a good point Mike, but Midshipmen with SNCO instructors is pretty much the same as boot camp for recruits. I’m guessing the pic is from OCS or the Naval Academy. Yeah, we take that rank stuff more Seriously than our blue-side brothers. But with a million different Rates I can see why they’re more lax. It’s all entry level training stuff. You gotta get used to stress of all types. @Bostonmarine: You dont seem to understand that this is not a form of leadership. It is a broken system that perpetuates itself through misguided children that never quite learn what it is to be a leader. It is the regurgitation of the actions of the many drill instructors before them. Do not try to sound superior because it comes across as arrogant and ignorant. @ilcpl: The only marines that “take this rank stuff more seriously” are those who have nothing more than rank to fall back on. I got out in may. CPL 0311. …but should we expect this same moron to shriek “Field on Deck” if he is the first one to see a Lieutenant Colonel approaching?